My copy of Lowe's Creative Ideas for Home and Garden arrived this week and, as I was flipping through the pages, I realized that you might be interested in this, too. It's a free subscription, and some previous issues have contained discount coupons or free offers. 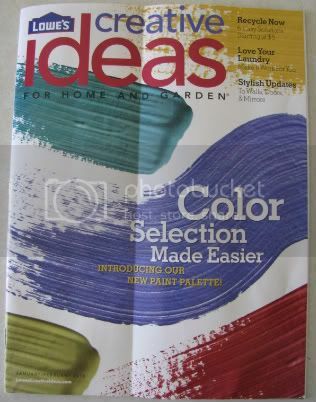 They also offer another publication, Lowe's Creative Ideas for Woodworkers. I don't subscribe to this one, but take a look if you're interested. Disclosure: I have no affiliation with Lowe's; I just wanted to pass this along. This offer is made by Lowe's and is subject to their terms and conditions. I saw the Creative Ideas and got all excited thinking it was a scrapping magazine;) LOL!! Something my Husband would enjoy. Thanks for sharing the link.